Corsair delivers a solid state disk upgrade kit for laptops, it includes a USB-to-SATA cable and the Apricorn EZ GIG IV software to clone your HDD data. Corsair®, a worldwide designer and supplier of high-performance components to the PC gaming hardware market, today announced the immediate availability of the Force Series™ 3 SSD Notebook Upgrade Kits. The kits, available in sizes of 120GB and 240GB, provide users with an easy, affordable way to upgrade their laptops to a solid-state drive (SSD) for improved performance, battery life, and reliability. Corsair SSDs provide significant advantages over standard hard drives. The solid-state design enables SSDs to deliver faster data read and write speeds which can reduce software load and PC startup times. And because SSDs have no moving mechanical parts, they help laptops run cooler, run longer on batteries, and resist data loss from bumps. 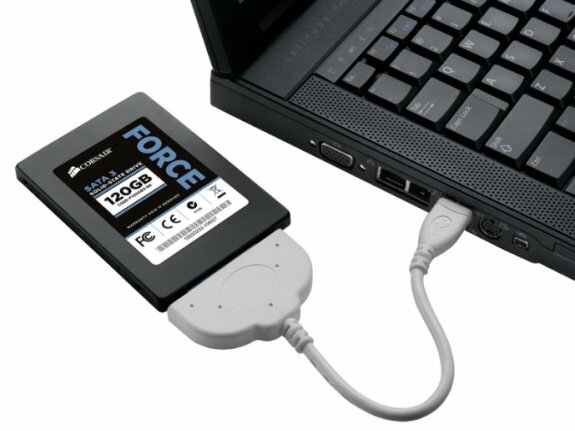 Force Series 3 SSD Notebook Upgrade Kits simplify the process of upgrading a notebook from a hard drive to an SSD drive. The kit includes a USB-to-SATA cable and easy-to-use migration software for transferring existing operating system, application, and data files from an old hard drive to the new SSD. The new SSDs come in a slim 7mm high case designed to fit in most space-constrained laptops. "Laptop owners have become more aware of the performance, power efficiency, and reliability of SSDs but many have been put off by the complexity of moving their existing data," said Thi La, Vice President of Memory Products at Corsair. "The new Force Series 3 SSD Notebook Upgrade Kits simplify the data migration process, making upgrading to an SSD easier than ever." Force Series 3 SSD Notebook Upgrade Kits are affordably priced with an MSRP in the United States of $139.99 USD for the 120GB model and $259.99 USD for the 240GB model. Both drives are available immediately worldwide.